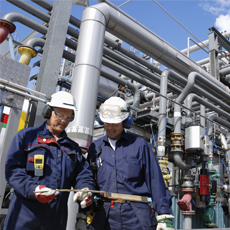 The SQA Advanced Certificate in Chemical Engineering builds on learners’ existing knowledge and their exposure to the systems and processes used in the chemical industry. It develops their knowledge and skills and enhances their employment prospects. Learners gain knowledge in subject areas related to chemical engineering including: mass and energy balance, heat transfer, fluid mechanics, and process operations. The course is designed to develop study and research skills, together with planning, development and evaluation skills. This qualification is available through a growing number of colleges, training providers and universities around the world. Typically, an SQA Advanced Certificate takes one year to complete. Learners who achieve an SQA Advanced Certificate in Chemical Engineering may progress to the SQA Advanced Certificate/Diploma in Electrical Engineering or the SQA Advanced Certificate/Diploma in Mechanical Engineering, then possibly to a related degree level course. SQA Advanced Certificates and SQA Advanced Diplomas can provide progression to degree-level study. The SQA Advanced Certificate in Chemical Engineering may allow direct entry into the second year of some degree programmes. For further information please refer to SQA’s progression partners. SQA Advanced Certificates and SQA Advanced Diplomas may also provide the knowledge and understanding required for related Modern Apprenticeships, eg the Modern Apprenticeship in Chemical Process Engineering and Related Industries. For further information on the structure and units of this qualification please refer to the group award specification.